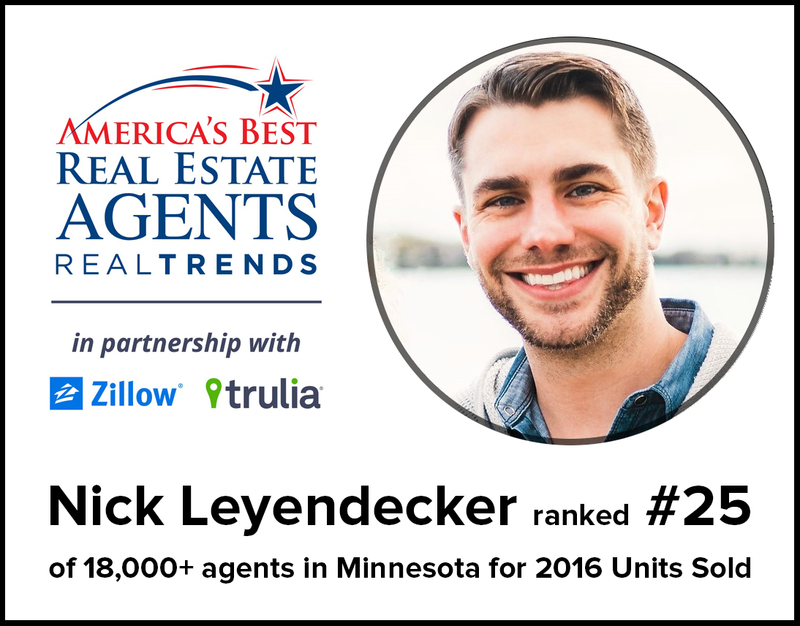 Nick Leyendecker was named one of America’s most productive sales associates as a part of REAL Trends' 2016 America’s Best Real Estate Agents, a ranking report produced by REAL Trends. He is ranked #25 for units sold and #26 for volume sold in the state of Minnesota and is now a member of “America’s Best Real Estate Agents”. To qualify for inclusion, an individual agent must have closed at least 50 transaction sides or $20 million in sales volume in 2016. For real estate agent teams, the minimum is 75 transaction sides or $30 million in closed sales volume. The individuals ranked in America’s Best Real Estate Agents had an average of 73 transaction sides and an average sales volume of almost $37 million. Teams ranked in America’s Best Real Estate Agents had an average of 144 transaction sides and an average sales volume of almost $61 million. This ensures that only the best of the best are included on the prestigious list.